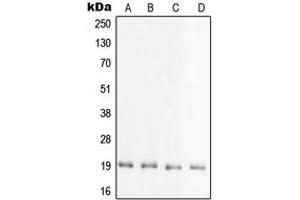 Western blot analysis of PRAF2 expression in HEK293T (A), mouse brain (B), rat brain (C), brain (D) whole cell lysates. Specificity Recognizes endogenous levels of PRAF2 protein. Immunogen KLH-conjugated synthetic peptide encompassing a sequence within the C-term region of human PRAF2.